Jiyang Yu, PhD, developed a code adjustment to an existing computational algorithm to give smaller computers the ability to process large amounts of data. During the past 20 years, the number of generated array or sequencing-based transcriptomic profiles has increased exponentially. What does this mean? Many computational algorithms have been developed to reconstruct gene regulatory networks from transcriptomes, or gene expression data. From these, researchers can find hidden drivers and regulators of cancer, immunological disorders, drug resistance and drug response. Yes, cancer research also has big data. 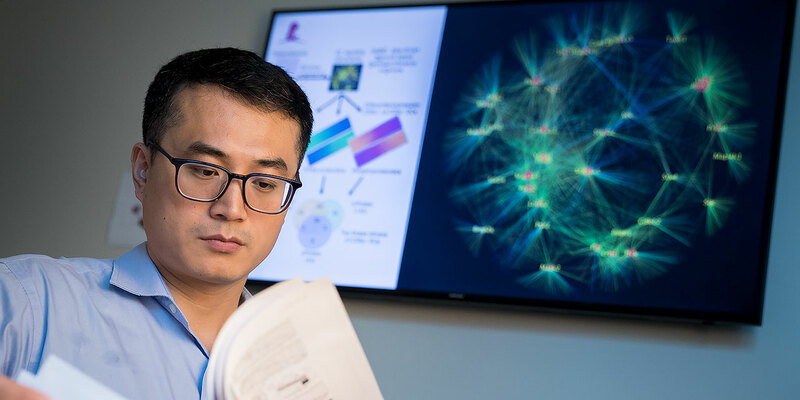 The Algorithm for the Reconstruction of Accurate Cellular Networks, ARACNe, has been one of the most effective and widely used tools to reverse-engineer biological networks from these gene expression profiles by using information theory that captures nonlinear gene-gene relationships. But with the growth of data, we found this tool required more and more memory and time to run. The problem with ARACNe arises when your data set involves more than thousands of samples. That’s when the algorithm requires an inordinate amount of computer power and memory — which limits research only to facilities with larger computer systems and power. So, we developed SJARACNe, a code adjustment to ARACNe, to allow it to process information much faster and with less memory. In fact, it really has no limit to the number of samples it can handle. Our work was published in Bioinformatics. With the improvement in SJARACNe, researchers with even modest computational resources can reconstruct complex regulatory and signaling networks from thousands of gene expression profiles. The program is freely available to anyone to use. Its features make it more user-friendly and more automated. In this case, we simply made a good tool better. Jiyang Yu, PhD, is a faculty member in the department of Computational Biology. View full bio.